Do you automatically ask for a new certification in a new leave year? Some companies like to get ahead of the FMLA certification game. That makes sense, no? Some might even send notices to employees who were on approved for FMLA around the end of the 12-month leave year, to get new certifications for the upcoming new leave year, if the employees have not already provided them. These employers may spend time and effort doing a great job tracking who has turned in certifications and when, who is approved, and who has been denied. In some cases, if an employee does not provide a new certification for the upcoming new leave year, he or she is considered ineligible for FMLA leave in the new leave year until a new certification is provided. While this process might seem like a good, pro-active step to ensure that employees whose need for leave spans multiple leave years have the certifications supporting the continuation of leave, the U.S. Department of Labor (DOL) frowns upon such a process. Why, you might ask? The DOL referred to the FMLA provision that an employee’s eligibility, once established, lasts for the duration of the 12-month leave year period. Therefore, if the employee used leave in a new FMLA leave year, then the employer could reassess the employee’s eligibility for FMLA leave at that time. It would not reassess an employee’s eligibility before the employee requested leave for the first time in a new 12-month leave year period. Part of this reassessment is asking for a certification. This means that employers are to wait until an employee requests leave for the first time in the new leave year before asking for a new certification. No asking for a new certification before that first absence; no asking for a new certification early. Therefore, if you are one of the employers who, toward the end of a 12-month leave year period, ask that all employees who are approved for FMLA leave at that time provide a new certification so their leave could be basically pre-approved for the next 12-month leave year period, you might want to reconsider. While it might seem counter-intuitive to undermine an employer’s desire to get ahead of the already complex FMLA process and tracking, it makes sense based on the entirety of the law. Once a 12-month leave year period ends, it’s basically closed. Only after a new year begins may you begin the whole certification process, and only when an employee actually puts you on notice of the need for leave may you ask for a certification. 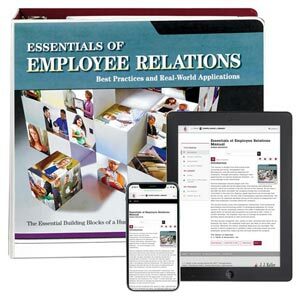 J. J. Keller's Essentials of Employee Relations Manual comprehensive guide is an ideal resource for anyone with responsibilities related to employee relations, including HR managers and supervisors, recruiters and more.